Light box church signs that will make your presence known. Our Signature model will allow you to tastefully identify your organization. Enhance your grounds and become a source of civic pride with a professionally designed and constructed sign! When graphic appeal and boosting awareness are your focus, light box signs are the perfect solution. Made from graffiti-resistant Makrolon SL® polycarbonate and finished with a durable powder coating, our Signature sign provides the maximum identification area of any model. We stand behind each of our light box signs with an outstanding warranty and superior customer support. Make an impact and make your presence known with your custom branding on an illuminated box sign! Maximum area for identification graphics. An industry-leading lifetime product warranty is included. Our Signature model is available in a wide variety of sizes to suit your needs. 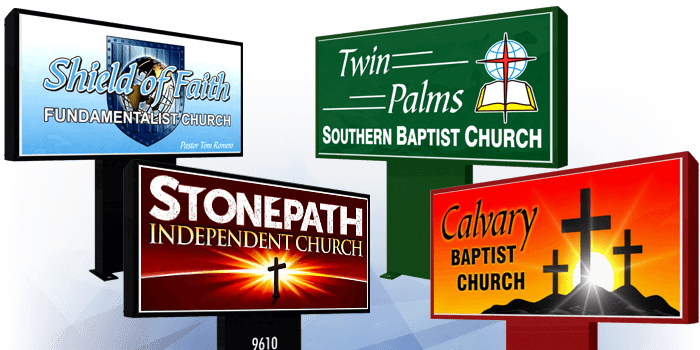 Below are just a few of the most commonly requested sizes of freestanding signs. Contact us to learn more. Leg height is adjustable to suit your needs. 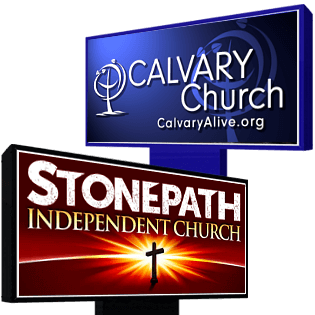 Our light box signs are highly customizable, providing your organization with a distinct appearance. Combined with our artwork capabilities, these signs will allow you to stand apart. 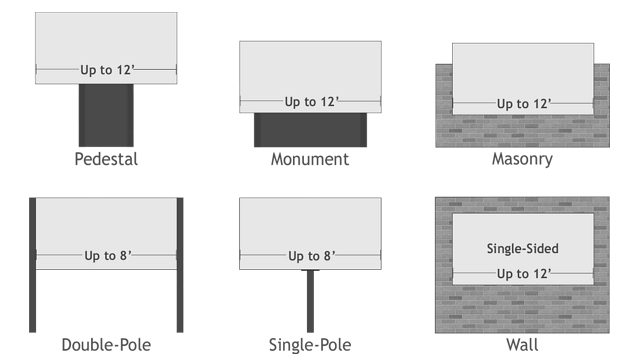 Our mounting options range from free-standing to wall and masonry mounted signs. Our most popular mount, the Pedestal, gives your sign a more substantial and professional appearance. Custom mountings and leg heights are available. The Signature is also available with changeable letter tracking attached directly to the sign face. Please contact us for more information about this option. First of all your sign is working great. I have had the best experience possible working with your company and staff. I will keep you in mind should I need any further signage in the future. Obviously, we are happy with the results of our purchase. There have been good comments from people in the church and community.